Lake Zurich, IL – CEO Corp has launched a new division, High Performance Packaging Group, dedicated to providing “best in class” shop floor productivity solutions to its clients, including flexible film products/carton materials and technical services. Over the past 25 years, CEO Corp, an automated packaging consultant serving food and non-food manufacturers, has helped many different types of plants--ranging from a single production line to large consumer packaged goods conglomerates--increase their efficiencies and reduce their downtime. As the technical staff of CEO Corp have worked side-by-side with machine operators and maintenance mechanics, they heard them voice their frustrations. HP-Packaging has launched a new website at www.hp-packaging.com to explain the performance advantage they can offer manufacturers. First, HP-Packaging begins working with a manufacturer or contract packager by looking at the whole picture--assessing the existing equipment and the applications that are running. Then, by drawing on their years of experience with various film structures and packaging materials, they search for the best solution for the manufacturer’s current environment. 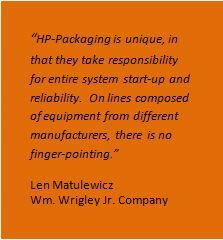 For questions regarding HP-Packaging’s products or services, call 847-679-6079 or visit www.hp-packaging.com.